If you have hidden the service timer, then go to settings in the slide out menu, ministry cards and show that card again. How can I support future development? Many people have expressed their desire to give a donation to support the development of the Ministry Assistant application, since there are a lot of costs developing an app. So if you want to support with donations, then there’s an opportunity to do so with PayPal using pixelslost@gmail.com address. If you’re a professional UX designer and have ideas how the app can be easier to use or look better, then you’re always welcome to create mockups and send me the ideas. How to switch between LDC and normal timer? Multiple publishers can be used on the same device if the device is a tablet with Android 4.2 or later and on some phones with Android 5 or later. 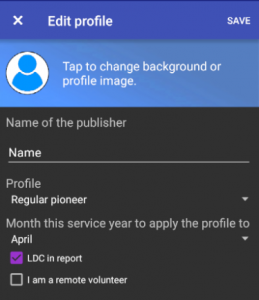 In Android settings, add another user and install Ministry Assistant for that user. Then you can switch between the different users and have one user for each publisher. The problem is that no other app is associated to handle that command. A workaround is to open Ministry Assistant, go to settings, and at the bottom check the option “Disable file association”. This can happen when you change the password for the Google account. Then the app can’t make backups to Google Drive or sync between devices any more. To fix that, open Ministry Assistant, settings, and at the bottom, remove the connection to the Google account. Then go to backup page and make a manual backup to Google Drive and pick the account again. 2. Make sure that you’re not running low on disk space, maybe uninstall some apps to free up space. 3. Open Ministry Assistant, backup page, restore tab and select a backup file to restore. If you haven’t made any recent, then select device memory and restore an auto backup file. 99% of the time the problem is that the pioneer profile isn’t set to the correct month. Make sure that it’s set to September of the current service year. The remaining 1% of the it’s because it correctly calculates LDC hours, that it LDC hours is included for a month, then you can only count 70h meaning that you can’t just take 840h – X ministry hours – Y LDC hours. 65h ministry + 20h LDC = 70h to reduce from the service year. 75h ministry + 20h LDC = 75h to reduce from the service year. 1. Make sure that both devices are running the latest version of the app. 2. On the device having problem syncing, go to Ministry Assistant settings, and at the bottom remove the connection to the Google account. 3. On the first page, do a manual sync and select the Google account again. 1. Try rebooting the phone and make sure that you have good Internet connection. 2. Go to Ministry Assistant settings, and at the bottom remove the connection to the Google account. 3. Go to backup page and make a manual backup to Google Drive. 1. Open Ministry Assistant and go to backup page. 3. Read http://www.ministryassistant.net/?p=30, how to restore it on the new device. Open Ministry Assistant, go to backup page, restore tab and select Google Drive. Select the account in the list if asked and then select the backup file from the list of backups. Is the backup is attatched to an email, then open that email on your phone/tablet and open the attachment and select Ministry Assistant. Save the attachment to file, open Ministry Assistant, go to backup page, restore tab and in top right corner use the browse button to find the saved backup file and restore it. Open Ministry Assistant, go to backup page, restore tab and select device memory and restore the file from the list. Open Ministry Assistant, go to backup page, restore tab and in top right corner, select the browse button and find the backup file to restore. The short answer is no, since the file is a custom file format, that can only be read by Ministry Assistant. But it’s possible to install an app player, like Bluestacks app player, install Ministry Assistant there and restore the backup file (see question about how to restore a backup file). Remaining hours are 840h – ministry hours – LDC hours, but correctly counting 70h max if LDC hours are included (65h ministry + 20h LDC = 70h to remove from the service year total. 75h ministry + 10h LDC = 75h to remove from the service year total). Balance and hours/month are calculated the first day each new month. Hours/month is just remaining hours/number of months left, telling you how much you should do each month for the rest of the service year. Balance tells you if you’re behind or ahead of 70h per month. If you in September did 65h, then balance for October is -5h. If you did 80h, then the balance is +10h. There are two ways of counting studies, manual and automatic. Manual: If you manually count studies from the Add to report dialog, then you can only add the study once per month or you’ll have too many studies in the report. Automatically: The best way is to automatically count studies. Mark a person as a study by tapping the icons to the right of the name/avatar in the person dialog an mark that person as a study. 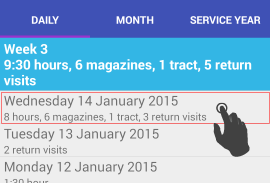 Then you can visit that person each day and only one study will automatically be registered in the report that month. What is LDC and how do I report that? LDC stands for Local Design/Construction Department and as a pioneer you can count hours, for example when helping building a kingdom hall. 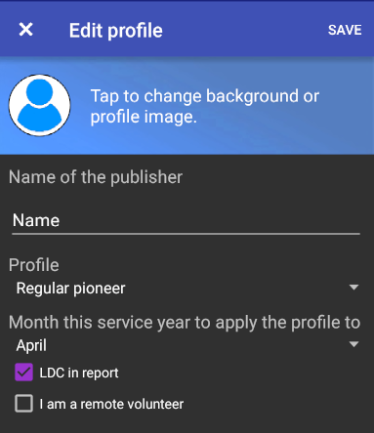 To enable LDC in the report, open the slide out menu and tap at the top area to open the profile editor and select the pioneer profile. If you want to enable LDC even if you’re not a pioneer, then go to Ministry Assistant settings and select that under the report settings. This card on the first page is calculating how much time you should do today to be in line with your goal. For example if your goal is 30h for the month, then you should do 1h/day. If you don’t do any ministry for 5 days, then it will tell you that you need to do 1h/day * 5 days = 5 hours that day to be on target to reach your goal. Open the slide out menu, and at the top middle, select a date in previous month and add the report for the month to that date. Do the same for the month you want to add report info for. To reduce time for different schools, like pioneer school, then go to report page and in the top right menu, select “Deduct time” and add a school to deduct time for. How to import a visit or a territory? In Ministry Assistant, it’s possible to export a territory or a return visit and send it to someone else and they can directly import that into their version of Ministry Assistant. To share something, open the item you want to share, like a territory, and tap “Share” in the top right menu and select to share as data to import. Then you can for example send it by e-mail to someone else. If both devices have NFC enabled, a quick way to share data is to open what you want to share, but the back of the devices together and tap to share when instructed. If you recieve a visit or territory by e-mail, tap on the attachment and select to open it with Ministry Assistant to import it. If it’s a territory and you already have that territory (determined by an internal ID), the territories will be merged and updated with latest data. This is practical when working as a group on a territory, where one publisher can send the territory to the others, they can take notes and send back and the original territory will be merged correctly. To take something back from the archive, tap the top left filter button in the page with all visits, and at the bottom, check to show archived visits. After showing all the archived visits, tap the three dots of a visit and select to remove it from the archive. This is most of the time due to too many filters applied. The more filters applied, the fewer results. To fix this, go to interested persons page, tap the filter button and deselect all filters so the filter button text changes to “Show all visits, tap to change”.